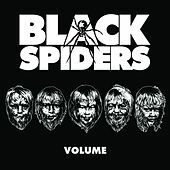 If they'd come out 10 years earlier, maybe Sheffield, England's Black Spiders would have been a garage-rock revival band; if they'd come out 15 years earlier, maybe they would have tried to sound more like Nirvana. But they came out toward the end of the 21st Century's first decade (first single "St. Peter" released in December 2008), so their particular loud-guitar-band aesthetic tends to land somewhere between '70s hard rock and early '80s new wave of British heavy metal -- albeit with a residual knowledge of grunge and neo-garage as well. The band comprises five guys, all zoologically nicknamed: guitarists "The Dark Shark," "Owl" and "Spider" (who also sings), bassist "The Fox," drummer "Tiger." 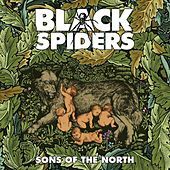 They put out EPs in 2009 and 2010; their debut full-length, Sons of the North followed in 2011.